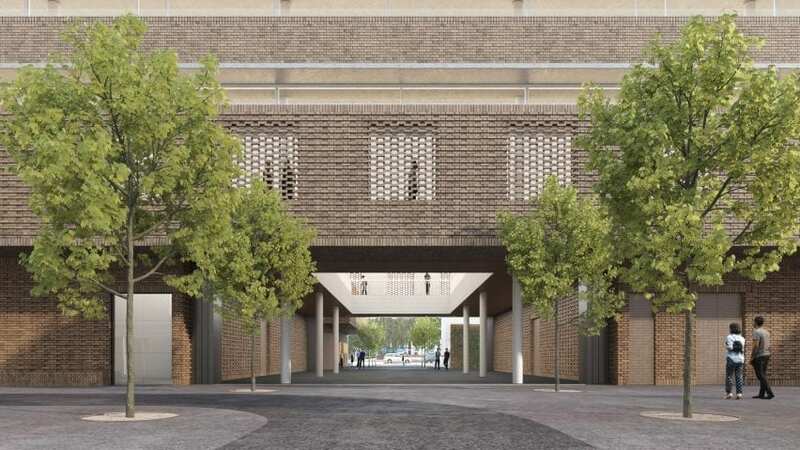 Herzog & de Meuron has submitted a planning application for the new Royal College of Art campus in London's Battersea, revealing a design that features textured brickwork and a sawtooth roof profile. The Swiss firm won a competition in late 2016 to design a new £108 million campus for London's foremost art and design school. A year later, it has submitted a planning application to Wandsworth Council for the project. The application features new visualisations, showing a facility with offset floors, large courtyard-style passageways and windows shaded by louvres. The images also show textured brickwork, similar to the new building Herzog & de Meuron added to Tate Modern, and a sawtooth roof, like the ones that Haworth Tompkins designed for the RCA's Dyson Building and Sackler Building, both located nearby. The 15,000-square-metre campus will provide facilities for courses that encompass design, science, engineering and technology. Paul Thompson, vice-chancellor of the Royal College of Art, said the project will help with its vision to nurture "the next generation of creative entrepreneurs". "We are thrilled with how Herzog & de Meuron have responded to our brief to create our new centre in Battersea to embody this vision, helping us to deliver transformational experiences for our students and ensuring that the UK continues to lead the world in art and design," he said. In line with this, the building will accommodate a range of knowledge and research facilities, with a focus on areas that are important to the growth of the UK economy – in lieu of Brexit. It will facilitate 10 new teaching programmes, along with a cafe and an art materials shop. Other features will include a "hangar" area for large-scale art and design projects, and expansive areas of indoor planting. Shortly after winning the bid, Herzog & de Meuron co-founder Pierre de Meuron said the project would "deliver innovation and expertise". "The Battersea site offers an opportunity to rethink the RCA campus and establish the patterns of connectivity and organisation that will make a successful building," he said. The Royal College of Art has been named the world's leading art and design university for the last three years in a row. It has a main campus in Kensington, but has gradually been expanding its Battersea campus over the past few years. Herzog & de Meuron fought off competition from a shortlist of six other high-profile firms to win the contract for the latest building. The firm, whose best-known projects also include the Laban Dance Centre in east London, is also currently working on a few other projects in the city, including a remodelled stadium for Chelsea Football Club and a cylindrical residential skyscraper. Visualisations are by AVR London.